After False Advertising gave us the low-down on all the cool spots in Manchester, we hopped on the train and headed north to Glasgow to speak to Tuff Love‘s Suse Bear about some of the happening joints to check out. Their new EP, Dregs, is released on 6th November via Lost Map Records, and adds flesh to the bone of opinion that has the duo of Bear (bass and vocals) and Julie Eisenstein (guitar and vocals) as one of the city’s most intriguing prospects. They may operate on the standard bedsit studio format but their sound has become increasingly confident, sunny even, as if determined to reach out beyond the grey waters of the Clyde. No wonder Ride saw them as perfect support for a round of comeback shows. I’m not a big drinker. My alcohol tolerance is ssooo lowwwww but I’m surrounded by fun nice pubs in the bit of Glasgow I live. The Doublet is my favourite place to go for a drink because it’s about twelve seconds away from my flat (I timed walking there once) and it’s a proper pub with no mood lighting and old carpets and old pictures on the walls, etc. 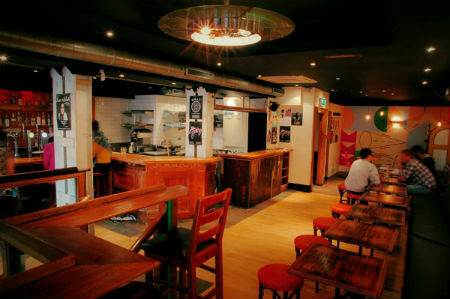 There’s loads of good places to drink in Glasgow. Like loads. I don’t think I like bars. Pubs are nicer. Another short walk from where I live there’s this place called The Squid and Whale. I really like Mexican food. Does anyone not like Mexican food? No, I did not think so. They serve Mexican cantina food (dunno what cantina means) and it’s 10/10 delicious. Also it’s a really chill place to be and there are cool colourful drawings on the walls. There’s a new venue just opened up close to me called The Hug and Pint. We’re playing there on the 21st November for our record launch. It’s got a pub upstairs and a venue downstairs. There used to be a venue right beside it (before Hug and Pint opened, a few years ago) called the Captain’s Rest which was my (then) local. It was so great, it was like Cheers, you could go in and you’d know people there and it was familiar. There was also an amazing venue downstairs where great bands used to play, and the sound system was amazing. Anyways that shut down for one reason or another and there was a void in my life. Now the Hug and Pint has opened, that void has been kind of filled. The venue downstairs is super cosy but really loud and good and they’ve got a great programme of interesting bands playing all the time. If I’m bored I can pop down and see what’s going on in the venue, knowing that it’s probably something decent. I don’t know how to dance, but only figured this out a few years ago so have been clubbing less and less since then… There’s loads of great stuff on post 11pm in Glasgow though. TYCI‘s clubnight in Glasgow is amazing: it’s a feminist collective in Glasgow and they puts on club nights and bands as well as making zines. Their nights are always friends and fun – they have a great atmosphere. They’re at Stereo, a cafe/pub/venue in town. There’s another night I’d like to go to called Push It on at Stereo; it looks great – female hiphop and R’n’B n stuff. But, yes, I don’t go outout past 11pm all that much, even though we’re totally spoilt for good nightlife in Glasgow. I need to buy some new jeans today. My girlfriend says it looks like “a baby has sicked on them”. They just have a little white stain, I don’t think they’re that bad. Anyways, I don’t know where to go to get them. I’m not good at clothes shopping. 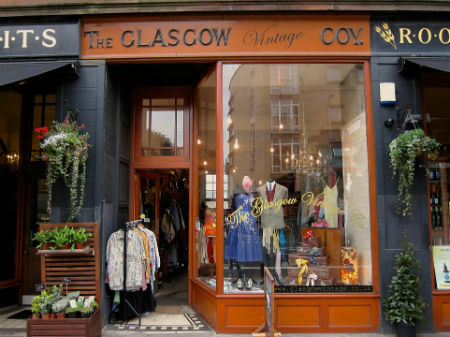 Sometimes though I like to look in a shop called Glasgow Vintage near my house. It sells vintage clothes and they’re not that expensive and they’ve been washed. Which is nice. They’re knocking down some the Royal Concert Hall steps in Glasgow city centre on Buchanan Street to build MORE SHOPS and I don’t know why. There are too many shops already! Anyways, maybe I just don’t like clothes shopping so I’ll talk about food shopping. I really like Roots and Fruits – an organic fruit/vegetable/food shop near my house – everything they sell is delicious! There’s a tea shop/shisha place on Otago Lane called Tchai Ovna. Otago Lane is nice and has an old watch shop, a record shop and something else I can’t remember. Oh yes, a book shop with piles and piles of books in it lying around everywhere. It’s unique because the shops there are old and the street is cobbled and stuff. They’ve just lost the lane to developers though after years of campaigning to keep it like it is. It’s all going to be crushed to pieces to become flats or something someone can make more money out of. Soon it won’t exist and all cities will just be duplicates of each other containing only flats, H&M, Tesco and nothing else. I went to see Peaches in 2006 with my best friend from school the year we finished. It was NNNUTTTSS. It was at the O2 ABC I think. It was full of lots of queers and I was like woooaaaahhhhhhhh this is so cool and also she was really good/exciting. Anyways, amazing gig. She’s playing the Art School in December. I will go if there are tickets left! I’ve lived in Glasgow since I was 0 years old. I grew up in the South Side of Glasgow near this park called Rouken Glen. It’s big, it has a waterfall and a skatepark (me and my friends wrote letters to politicians/the council to get one and they finally built one the year I moved away :/ ) Anyway it’s a lovely chilled space I used to go sit in the woods there and think about stuff. I also used to walk my dog there, and have so many memories from childhood of being there. I like to go walking there some times still, it’s only 20 minute train from Glasgow city centre. Glasgow’s amazing because it’s so close to the wilderness. I know Rouken Glen is a park, but if you drive 30 north of Glasgow you can be not in the city anymore and climbing a big hill instead. Tuff Love are available to romance at their official website. Updates from John Cale, The Fall, Savages and more.